The Smithsonian, along with nine other organizations, is a founding partner of the Future of Information Alliance. FIA, hosted by the University of Maryland, is described by co-director Ira Chinoy as a "thinktank without walls", interested in fostering interdisciplinary discussions of the role of information in our lives. 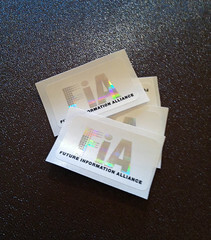 FIA stickers from Launch Week. From November 14th-18th, the University of Maryland held a weeklong launch for the FIA, with five brainstorming discussion sessions. I was happy to be able to attend two of these sessions, "Visiting Future-ists" and "Creativity and Culture". Both sessions featured "future-ists" Dan Russel, director of user happiness for Google, Mary Czerwinski, from Microsoft's VIBE group, and Abdur Chowdhury, former chief scientist at Twitter. In the first session, the future-ists described their own work and the opportunities and challenges they saw in information. 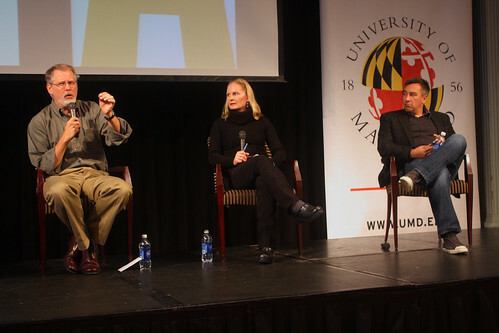 In the second session, the future-ists were joined by several University of Maryland faculty members to discuss the role that creativity could play in innovation and information. Other sessions over the week were "Transparency and Boundaries" and "Science in Our Lives". Dan Russell, Mary Czerwinski, Abdur Chowdhury. Photo by Evan Golub. Courtesy of FIAumd on Flickr. Both of the sessions that I attended included lively discussion. In the "Visiting Future-ists" meeting, Dan Russell noted that only 10% of English-speaking web users were aware of the Ctrl+F feature used to search a document or web page. This worried many people in the audience. When someone asked the panel how to bridge a tech divide like this, Mary Czerwinski posited that the problem isn't teaching people, the problem is that Ctrl + F is a poor user interface and isn't intuitive. Another interesting quote came from Abdur Chowdhury, when an audience member asked what one should do if he or she realizes the academic institution wasn't a good fit for him or her. Chowdhury responded, "It's called a 'library'". Besides creating interesting discussion on the future of information, FIA hopes to announce a seed grant program in the next few months. Winning projects will be characterized by an interdisciplinary approach to solving real information problems. I look forward to seeing what these innovative projects may be! Previous Post Smithsonian Libraries Website Redesign – Coming soon!